Mazkir Rabbi Yehuda Krinsky has given the Rebbe’s maaneh lashon booklet to Shliach Yitzi Hurwitz who’s battling ALS. Rabbi Yitzi Hurwitz, Director of Chabad of Temecula in California who is battling ALS disease, visited the Rebbe’s Ohel gravesite in Queens to pray for his and his family’s well-being on Tuesday. He was not alone. Members of the committee coordinating his medical and financial bills flew in from the West Coast to join him: Rabbis Shmuel Fogelman, Shlomo Bistritsky, Rueven Mintz,Yossi Baitelman and Simcha Backman……. At a Bar Mitzvah at a California winery for the son of Shliach Yitzi Hurwitz, friends said they will be covering his medical bills. 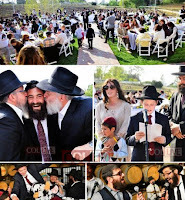 Some 400 people come to the Lorimar Vineyards & Winery in the picturesque wine country of Temecula, California, for the Bar Mitzvah celebration of Eli Chaim Hurwitz last week. Lawrence Lipton and Mark Mansfield, owners of the winery, originally set up for 150 participants. But they watched with joy as the crowd quickly swelled with guests driving in from as far as San Francisco. 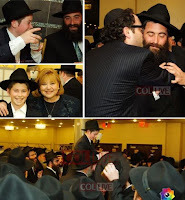 The most joyous Bar Mitzva celebration was held Wednesday for the son of Rabbi Yitzi Hurwitz, the California Shliach suffering from Lou Gehrig’s disease. The theme of the evening held Wednesday night in Crown Heights was the saying of our Sages that “simcha poretz geder,” happiness and joy have the power to transcend barriers. It wasn’t that guests of Eli Chaim Hurwitz’s Bar Mitzvah celebration needed a prerequisite for their attendance. But they all wanted to make it the most joyous and memorable event possible……. Shliach Yitzi Hurwitz, diagnosed with ALS - Lou Gherig's disease, tells how much visits from friends and family mean to him. Diagnosed with bulbar onset ALS otherwise known as Lou Gherig's disease. I am not able to speak, eat or drink. Barely able to walk with help. Left hand is useless and my right can do little. I sit most of the day in a power wheel chair which I'm grateful for. Thank GD I can see, hear, smell, taste and feel. It's just some muscles that stopped working. Most things are done for me as I am no longer able to do the do even the simplest of things on my own.